Many of you may be too young to remember this, but there used to be a time when pretty much all wedding receptions used plain white linens. If it was a wedding, then you used white. Period. Of course today, it’s all about color, texture, layers and personal expression, and really, the options are endless. To spark some creative fire we’ve identified six new trends appearing now in wedding reception design. 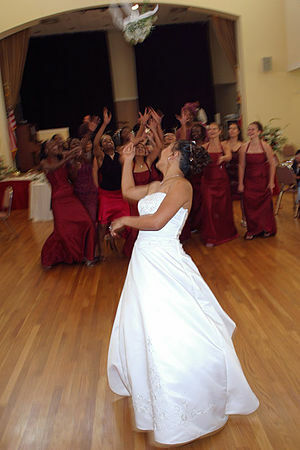 #1 – Color my world: As mentioned above, color in weddings is huge. Any color family that appeals to you will offer a huge range of shades that are beautiful and current. In fact, there really isn’t any color that’s considered “out” – so the sky’s the limit! Love “blue”? That could mean midnight navy, Tiffany blue, pale ice blue, bright aqua, ocean blue… You get the idea – the list goes on! A few new colors worth pointing out are persimmon – a spicy, vibrant shade of orange; saffron – a rich, deep yellow; and butter – a warm, soft, golden-yellow. #2 – Texture is hot :Texture in weddings – from bridal gowns to napkins – is huge. In linens, this can mean a crushed look, pintuck fabrics, damasks, or other tone-on-tone designs. It can also be expressed through layers, such as using sheer overlays on tables or table runners on buffet tables, and accessories such as beaded candlesticks. #3 – Think metallic: As you may have noticed in the fashion world, metallic is sparkling hot these days! Mixed metals, matte metals and texturized metals are all very current looks that can be incorporated into your wedding reception design, through metallic fabrics, accessories or even the furniture. #4 – Cool grey is hot, hot, hot: You’ll find that many of these trends are interrelated, such as grey, which can be expressed using metals such as silver, aluminum or nickel. Using a brushed aluminum planter for your centerpieces would actually incorporate three trends: texture, metallic and grey. A wide range of styles and shades of linens in grey tones is also a beautiful, trendy look, and can be accented with other colors such as black and/or white, any shade of red from blush pink to fire engine red, and so on. Experiment! #5 – Lace is back: In wedding gowns and now in wedding design, lace has made a big comeback after being missing in action for many years. It’s a beautiful way to incorporate a sense of tradition, history and romance into your wedding day. 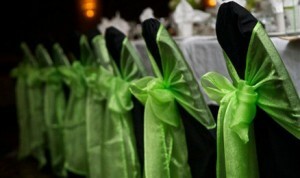 Table linens, especially, have appeared in a variety of tone-on-tone laces, and more colorful options as well. Incorporating a metallic lace over a solid color fabric is another new look. Looking for a clean, modern, streamlined wedding day look? If “no frou-frou” is for you, then consider applying some 1960s-style geometric design elements. If you’re feeling casual and funky then use lots of color with strong geometric designs – like white, bubblegum pink and chocolate brown; or black, white and lime green. If you want a more elegant, formal feel use tone-on-tone designs or a geometrically designed fabric like a pintuck. The best advice, really, is “don’t be a slave to trends!” Follow your heart, trust your instincts, and create your own unique wedding style. Of course, don’t underestimate the help, input and advice of wedding professionals who can make your dream a reality with minimum stress and maximum results. With their professional guidance and years of experience, your wedding day will be beautiful expression of your personal style. Take the time to experiment, and really try things out before deciding on your overall wedding décor, table linens, etc. Some colors, fabrics and textures look completely different in different lighting, so how it looks in the bright fluorescent lights of the showroom is NOT how it will look in your dim, candlelit reception room. When you meet with your wedding designer and/or linens provider, it’s most helpful and efficient if you come armed with as much detail as possible about your wedding, such as photos of your wedding dress and bridesmaids’ attire, any cake or floral information you have and so on. Also, if you have a specific color in mind, bring in an actual sample – verbal descriptions just don’t work! If you love a bright, vivid color but are concerned about it being “too much,” consider using it as an accent color in the room instead, such as in the napkins and chair ties. If it’s a small wedding, bright fuchsia table linens may work, but a grand ballroom filled with 40 hot pink tables may be a bit overwhelming. By experimenting with different sheers placed over various colored fabrics, you may find your own unique combination that gives you the look you want. Ideally, do this in the same lighting that your reception will be in for an accurate vision! You would think it would be easy to choose the right wedding colors for your big day right? Perhaps you want that periwinkle blue that has been your favorite since you were a little girl. 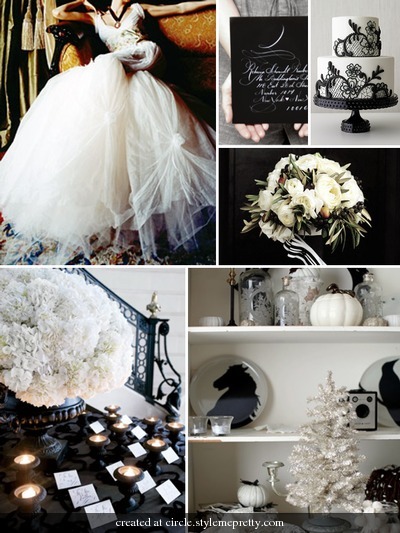 Or what if black is your favorite color, is that appropriate for your wedding color in the middle of August? The wedding colors that you inevitable decide on will play a big part in setting the mood of your wedding and theme as well. For example, a beach wedding might be perfect with natural colors that complement the sea and sky. Overall, when you choose your wedding colors you are also choosing the look and feel of the bridesmaid dresses, the flowers, the invitations and even the look of the ceremony and reception. Not an easy task, but overall the decision should be yours and you should enjoy the freedom to make your big day the one you have dreamed of since you were a little girl. One thing to keep in mind in regards to bridesmaid dresses is the material. The truth is you can get by with almost any color anytime of year as long as the material is right. You don’t want your bridesmaids in wool dresses in Florida, nor should you opt to have the material that of chiffon in the middle of December in Chicago. Colors do seem to make an impression on people so let’s take a look at the many options to choose from depending on the season. One of the most important things to remember is that when you mix color you want to make sure they coordinate just right. Some colors are better in the background while perhaps that tango red you have your eye on is apt to stand out for more than the accompanying yellow or gold. Start with a base color and follow that with lighter and darker shades in the same color family. Another example would be two or three colors that complement one another easily. Take yellow, yellow and green and then have the additional green tones accent as well. Depending on the season and how festive you want to be you can have fun with winter, spring, summer and fall. Since many brides choose the summer for their big day let’s start there. Bright colors are always popular during this most beautiful time of the year. A good idea it to take advantage of all the flowers that are in bloom during the summer months from pink to red to yellow to bright blues and purples. 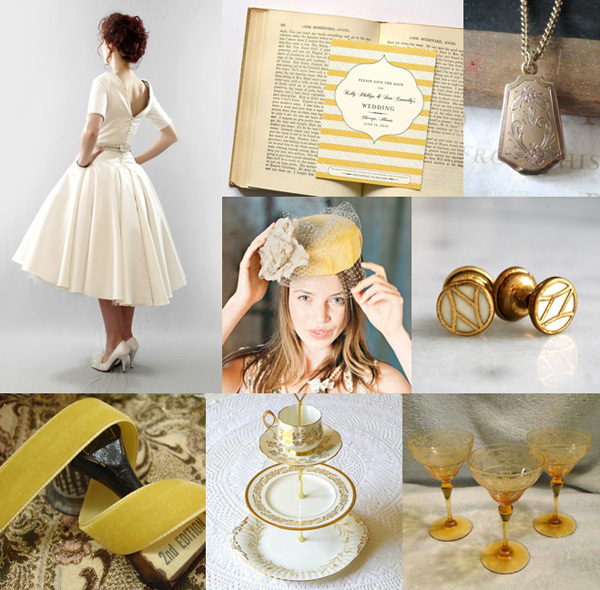 Summer is also a time to enjoy the sun so you could choose yellow or gold for the occasion and add some touches of pastel for a soft touch on invitations and reception accents. Popular summer colors include teal paired with silver and you could also dye flowers teal to play up the mood and atmosphere. What about red and pink? Roses are the perfect flower for this color scheme. Many couple choose autumn to say their “I do’s” and this season bespeaks bold colors with a touch of harvest. It’s a time when the leaves are falling from the trees and burnt orange, gold and red are in the air. It might not be a bad idea to incorporate brown during this time of year and consider matching it with terra cotta or copper or even ivory. Red is always popular during the autumn season and can be matched with deep red roses to keep the mood one of love. For winter think the holidays, snow and cozy fireplaces that make this season one of the most romantic of all. While stark silvers and blues are an option, the color of evergreen also promises the mood will be festive. Flowers can be a combination of pine cones, holly leaves and even snow and ice. Since silver is such a popular winter color matching accents might include burgundy or navy blue. The spring is when everything begins to grow again. Pastel colors are popular during this time of year so think white, pink and even lavender. Flowers that go well with a light color scheme are tulips and peonies. Keep the wedding light and airy like the season and a dreamy feeling will surely abound. When you do pick the colors for your wedding make sure you can get the bridesmaid dresses in this color as well, even before you begin ordering the other necessities. For flowers, if you must have a certain type then you can work around the flower colors to determine the final color choices. Remember too that the colors you choose, no matter the season, should not clash with the church or banquet facility. Finally, invitations should reflect the color of your wedding, but can also reflect the season as well. In the winter snowmen or appropriate and in the fall you might think of apples and fallen leaves. 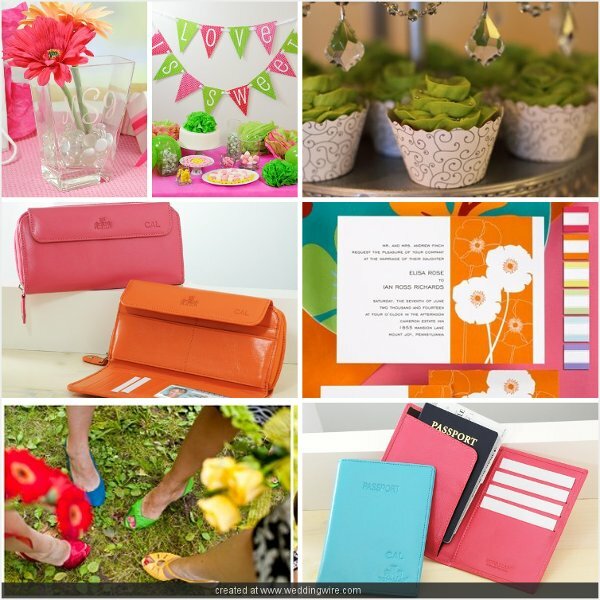 If you are planning a theme wedding think of the location as well as the color. Evening weddings can be a little brighter than day time weddings and for medieval themes go with heavy material and colors to reflect that time period. Overall, the best wedding is the one that you add the special touches to incorporating you and your spouse’s ideas into the biggest event of your life. Start at the beginning. Make sure to choose the place of the ceremony BEFORE you choose your colors. You would think that nothing could clash with turquoise blue, but trust me you will find the walls of a banquet hall that will. Be realistic. If you plan a religious ceremony that calls for possible kneeling, you may want to opt out of the form fitting / mermaid dresses. Popular with guests. It is not written in stone that your wedding ceremony has to take place between ten and two. Think about having an evening/night wedding by doing the photos first and therefore not making your guests wait around for the shin dig to re-start between the ceremony and dinner. Themed Weddings: Have a themed wedding –a specific time period, a country or sports team that the two of you love. Or even a costume theme! (Be aware that most guests will not want to dress up). Think about how much fun and interesting it would be to plan the event around the theme of your choice. Some of the most popular themes are winter, tropical, and garden. Your close connections. To include more people in the ceremony have them read a poem or prayer or sing a song at the ceremony. A special moment for Mom. If you and your mom are very close, think about asking her to be your “matron” of honor, or have both parents walk you down the aisle. Just don’t leave out Mom. Mistakes that turn into fond memories. Keep in mind that things will not go completely according to plan. That is not necessarily a bad thing. It gives the entire ceremony “personality” and will richen what will inevitably become the prologue to the story of your lifetime. Two by Two: No one said your bridesmaids and groomsmen have to match in height/and or age. Feel free to mix and match bridesmaids and groomsmen as you think they would feel most comfortable, and even feel free to throw in a loaner. Nice extra. During the ceremony, recognize important people by giving them flowers. Personal story. Ask the officiant to work in a story about your meeting or courtship into the ceremony. Fun and furry. Can’t find a ring bearer? Use the family pet! In the round. At the ceremony, arrange the chairs so that everyone surrounds you. Arriving at your ceremony, relaxed and unruffled, in a chauffeur-driven limousine is the perfect way to begin your wedding day celebration. Limousines can be acquired for the entire day, picking you up at home and delivering you to the ceremony, the reception, and even to the airport to depart on your honeymoon. Most companies have a one to two-hour minimum for their services, so put some thought into what the most cost-effective option will be: keeping your limousine on call throughout the entire ceremony and reception or hiring one limousine to take you to the ceremony and reception, then another for leaving the reception. Traditionally, one limousine carries the bride and her father to the ceremony, while a second limousine or sedan transports the bride’s mother and bridesmaids. Of course many brides opt to have both parents or their attendants ride with them. It’s simply a matter of personal preference. After the ceremony and reception, the newlyweds ride together, either alone or with the maid of honor and best man. 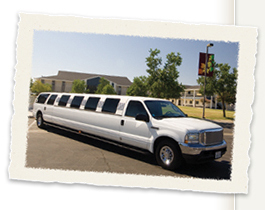 A formal limousine seats four people, while stretch limousines can allow for six to 10. Limousines are usually black or white, and new models include sport utility varieties–the Hummer and Explorer are two possibilities for a rough-and-ready look. Some companies offer fleet rates for those who want the entire wedding party and family to arrive and depart in regal style. The choice you make depends not only on how much you wish to spend or the impression you wish to make, but also on the level of revelry. If the day is to be filled with many champagne toasts, providing safe transportation for those who will be celebrating the most is a smart idea. A limousine is a luxurious way to travel; however, there are creative alternatives to this standard bearer that can add a distinctive mark to your ceremony and reception. One option is a luxury coach. With all the amenities and style of a luxury limousine with room to spare, these vehicles can seat 10 or more people comfortably. 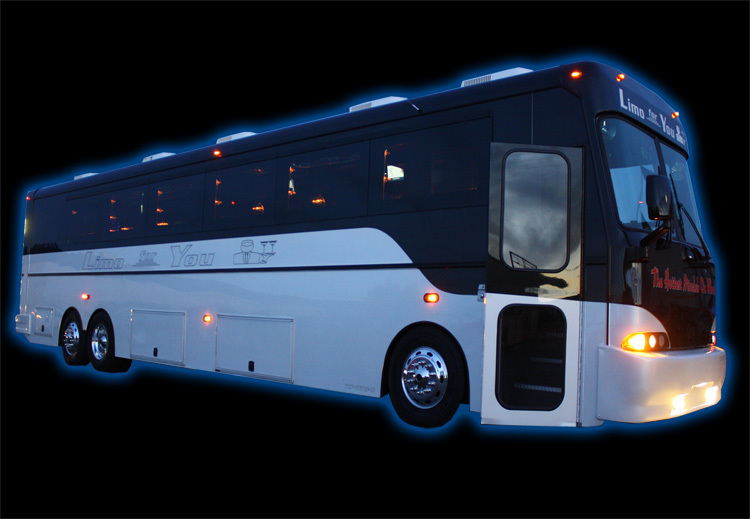 A passenger coach, without all of the added luxuries, can seat anywhere from 21 to 49 people, which is a great way to transport your family and guests, especially if your reception is located in an out of the way location or if parking is an issue. A luxury coach allows the bride and her attendants to spend time together surrounded by mobile luxury on the way to the ceremony. After the ceremony, the bridal party can enjoy a grand celebration with the bride and groom while traveling to the reception. Like limousine services, passenger and luxury coach companies require a minimum number of hours. The size and type of coach will determine the hourly rate. Depending on the size of your party, it may make sense to hire two coaches, perhaps a luxury coach for the bride, groom and their attendants and a passenger coach for the guests. By having more than one vehicle, it will allow some guests to leave at different times if needed. For those who prefer something more creative or romantic in transportation, there are many unusual offerings. If a horse-drawn carriage is available in your city, this is a charming option. This service can vary from a simply carriage to an elaborate coach. Although space in the buggy will undoubtedly be limited, there is nothing quite as beautiful and romantic as a bride being led to a waiting carriage with beribboned steeds and driven away under a clear blue sky or starry night. 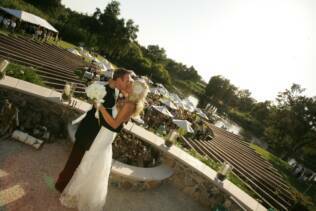 It can be an unforgettable experience for the happy couple as well as a memorable sight for the wedding guests. Vintage or luxury cars can also add a touch of class: a Bentley, Rolls Royce or even a kitschy pink Cadillac can be the finishing touch for your wedding’s personal style. Even Harleys or horses can transport the bride and groom—if that’s your style, of course. Whether you choose a limousine, luxury coach or horse and carriage, you should confirm your transportation booking and verify pick up and departure times well in advance of your wedding day to avoid any mix-ups. It would be wise to have someone closely associated with the wedding party, perhaps the best man or a family member, designated to coordinate with the chauffeur to make sure that pick ups and departures happen on schedule. The size and location of the ceremony and reception, as well as personal taste, will help define your final decisions for travel. There are many options available for today’s bride and groom, and with just a little creativity and planning, you can find the mode of transportation that best suits your style. Wedding rings have long been a customary symbol of marriage. Your wedding rings are special because they say that even in your uniqueness you have chosen to be bonded, to allow the presence of another person to enhance who you are. These rings symbolize the vows you will take…circles without beginning or end…symbols of enduring love and a lifetime of friendship. These rings mark a long journey together of giving and receiving love, signifying to all the bond of marriage the two of you share. You may already have some idea of what you like, but once you start shopping for your engagement ring you still may find the choices overwhelming. Solitaire, gold, platinum. Matte finish, satin finish. There are so many options, each beautiful in its own way, which means you’re faced with the difficult task of finding the perfect ring that feels and looks just right for you. After your selection then comes the often difficult task of also paying for it. Many people are aware of the two-month rule, which suggests the value of an engagement ring should equal two months of the groom’s salary. Therefore this makes your purchase a considerable investment. The groom will also be purchasing the bride’s wedding ring, and although tradition indicates that the bride purchase the groom’s wedding ring, some grooms purchase this as well. With such a great deal of money involved, it is imperative to get what you pay for, so here’s a quick guide. The most important element to consider when shopping for a diamond is cut, color, clarity and carat–the four Cs. Contrary to popular belief, cut and not carat is the number one factor in determining the value of a diamond. A well-cut diamond beautifully directs rays of white light to the diamond’s facets, the small planes on the surface of the stone. The reflected light emanating from the facets defines a stone’s fire and brilliance. Fire is the intensity of the rainbow of colors cast outward in a prism-like effect, while brilliance indicates the amount of sparkle generated. Cut should not be confused with the shape of a diamond, which includes brilliant (round), oval, pear, marquis, emerald, square, heart and triangle. The color of a diamond is the next quality to consider. The best color is no color at all, since an absolutely colorless diamond reflects light most beautifully. The Gemological Institute of America (GIA) ranks diamonds on a standard 23-grade scale, from D through Z. D, the highest rating, indicates a perfectly colorless stone, while Z, the lowest rating, indicates a light yellow stone. The color ranges within this scale are colorless, near colorless, very light yellow, and light yellow. Next to consider is the clarity of a diamond, which is defined by the number, color, nature, size and position of natural marks–called inclusions–contained in the gem. Inclusions occur naturally during the process of crystallization, when minute traces of minerals are trapped in the diamond. The carat weight of a diamond is the final consideration. In ancient times, gem size was measured against carob seeds, which are remarkably consistent in weight. One carat equaled the weight of a single carob seed. 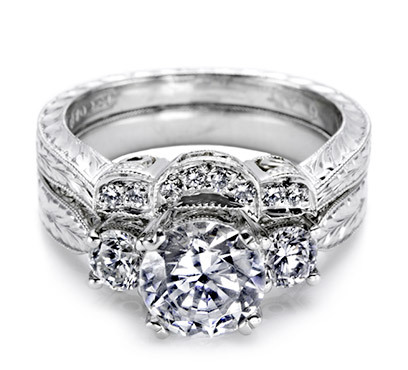 In today’s terms, a carat is the standard metric weight of 0.2 grams, or 1/142 of an ounce. Another way to indicate a diamond’s weight is in points, with one carat equaling 100 points. So a diamond of 50 points, for instance, equals 1/2 carat. Diamonds of more than one carat are extremely rare (one in a thousand), and therefore very valuable. But remember that carat weight is only one factor in determining value. 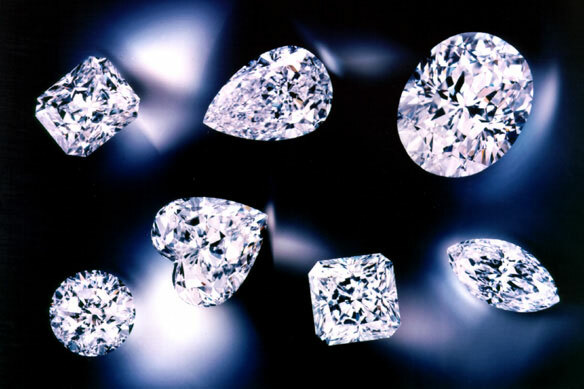 Two diamonds of the same size can vary considerably in value depending on the other three factors cut, color and clarity. 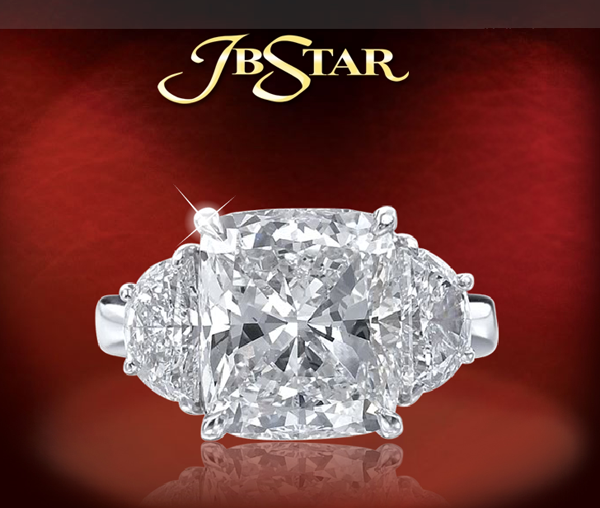 Once the rings have been selected and purchased, request an appraisal. This is a written estimate of the value of your jewelry. Appraisals of diamonds should include specific indications of the four Cs. Immediately after the purchase, have your jewelry photographed for insurance purposes, and make sure your current policy has adequate coverage. If it does not, consult your insurance agent about amending your policy. Although diamonds are the hardest natural substance known to man (2,000 times harder than rubies or sapphires and 3,000 times harder than emeralds), you should not wear them when performing rough work. A hard blow can still chip a diamond. You should also avoid direct contact with chlorine bleach or chlorinated pool water, which could pit and discolor the mounting. On the rare occasions when you do not wear your diamonds, store them alone in a fabric-lined jewelry case or in a jewelry box with separate compartments. This precaution keeps your diamond ring from scratching against other jewelry, including other diamonds. Diamonds, like other gemstones, get smudged and dirty from natural oils, lotions, perfumes and hair spray. To keep your jewels clean, regularly soak them for about 30 minutes in either a commercial jewelry cleaner, or homemade solution comprised of equal parts cold water and ammonia, or a mixture of warm water and mild detergent. Brush the stones gently with an eyebrow brush, then rinse thoroughly under warm water and pat dry with a lint-free cloth. Have your rings checked annually by your jeweler for loose prongs or settings. You’ll be repaid for these small precautions, and the gentle care you give your ring, with years of enjoyment and pride in this precious symbol of your marriage. You’re married, cocktails and dinner are over, it’s time to kick up your heels and hit the dance floor! This truly is one of the most critical wedding decisions you’ll make, because nothing can make or break a wedding celebration faster than the entertainment. Fortunately, most wedding vendors are talented professionals, and with the tips included here, you’ll be able to confidently select an excellent entertainer for your big day. Your first big question to answer will be “do we want to have live music (a band or orchestra) or a DJ”? While there are pros and cons to both, it really boils down to personal taste and budget. Using live music – a band or orchestra – provides a certain festive energy to the evening, and is a wonderful option if your budget allows it. The key is to find a band that specifically does weddings, so that they can offer the versatility you need for a good event. Any live entertainment includes breaks, which can interrupt the flow of your evening, so try to come up with a solution that ensures that music is always playing. If the band is large enough, see if the band members can stagger their breaks so that someone is always playing. 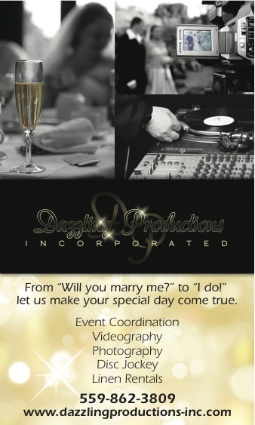 Or, hire a pianist or DJ to play during the breaks. Also, good, popular bands or orchestras will usually be more expensive than a DJ. They are well worth the expense, of course, since good entertainment is such a critical element of the wedding, but it just doesn’t fit everyone’s budget. And if you can’t afford a GOOD wedding band, then consider a DJ.